If you missed this magnificent monograph the first time around, grab it – now. Australia's first supersonic combat aircraft, Dassault's Mirage IIIO served as an RAAF front-line fighter for over 20 years. And MMP's Mirage IIIO: Colours & Markings superbly recaps the whole terrific tale in 312 pithy pages. The late Paul Mason and Darren Mottram leverage official and private sources – metaphorically, mountains of minutiae – for their amazingly authoritative, densely detailed dissertation. 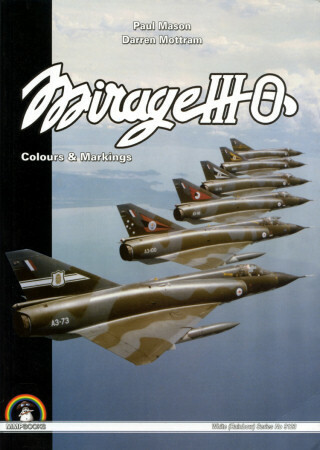 Contents cover absolutely all Mirage IIIO liveries: camouflage and commemorative, special and spectacular, ornate and unadorned. War paint. Grease paint. Custom paint. FS matches. BSc colors. Standard schemes. One-offs. Zaps. And specs. They're all here. Hundreds of pretty pictures – Mirage IIIO photos, close-ups, markings details, 1:72-scale drawings – pack this production. And outstanding color profiles by the inimitable Juanita Franzi will really rouse your modeling muse. But don't skip MMP's text – especially extraordinarily interesting, informative introduction. Just see what "adversaries" RAAF Mirage pilots caught in their gun sights! Over 1,400 Mirage IIIs were built. And for the definitive details of Australia's flamboyant few, get MMP's brilliant book – before it goes out-of-print again! I want to thank Casemate for the review copy.